Festus, be a darling and fetch me my cast iron skillet would you! I was born in 1960 and never became much of a fan of Gunsmoke. The western that we watched as kids was The Wild Wild West which only was on TV for four years from 1965 to 1969. In Wild Wild West, James T. West, played by Robert Conrad, and Artemus Gordon, played by Ross Martin, were U.S. secret agents whose job it was to protect President Ulysses S. Grant and the United States from danger. The traveled around the west in their own train, the Wanderer, which also featured in an episode of Gunsmoke titled “Death Train.” My dad, Dr. Richard Briggs, was an obstetrician and in the 1960s we were living in L.A. He told me that he delivered Ross Martin’s baby with Ms. Martin playing a starring role. The only character from Gunsmoke that I can remember was Festus Haggen. Festus means cheerful in Latin. Festus was kind of a simple guy and was Marshal Matt Dillon‘s deputy. Whenever he was angry at someone or something he would shout “You ornery ole scutter.” Ah the good old days. Anyway, Festus was often cooking things on campfires or old pot belly stoves, and his cookware of choice was always a cast-iron skillet. 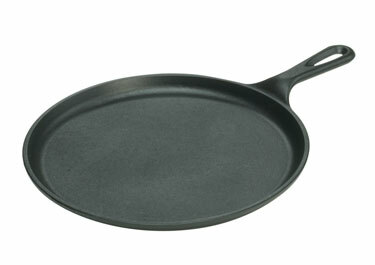 Those types of skillets are still available for purchase from a fine American firm: The Lodge Manufacturing Company of South Pittsburg. Lodge Manufacturing is the largest maker of cast-iron products in America and their 235 workers make up the family that works at the Lodge Manufacturing Company. According to Larry Raydo of Lodge, “There’s quite a few fathers and sons who work here. We actually have right now a father, son and granddaughter who all work here. It’s a very family atmosphere.” Lodge Manufacturing is located in South Pittsburg, Tennessee, which is the hotbed of cast-iron cookware manufacturing in the U.S. 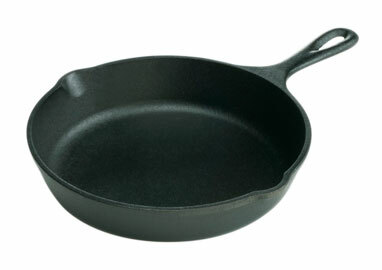 The raw materials for a cast-iron skillet comes from several sources — pig iron, scrap discarded from other foundries, and Lodge’s own internal scrap and returns. Lodge uses about 50 per cent of their own scrap iron and returns, 25 per cent steel, and 25 per cent pig iron to make their world-class skillets. I would not recommend too close a look at the Lodge Manufacturing skillet production process as it gets up to a balmy 2500 degrees Fahrenheit in order to turn the raw materials into a molten form. 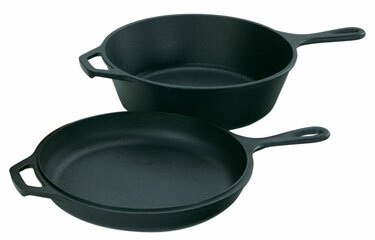 To make a Lodge cast iron skillet, Lodge’s craftspeople make two molds made of sand, one for the top of the skillet and one for the bottom. The two molds are brought together in a machine and then molten iron is poured into the void between the two molds creating a perfect casting. The molds are made of sand and in order to clean the excess sand off the skillets, Lodge fires round BB’s of steel at the skillets from the top and the bottom which removes the excess sand and gives the skillets a bit of a finish. After this process, the skillet is sprayed with vegetable oil to inhibit rust. After that, the skillet goes into an oven, is baked and when it comes out it is ready to be shipped. From start to finish, it takes about 2 hours to make a Lodge skillet from the creation of the sand molds, to molten iron poured into the mold containing it, to cleaning, polishing and seasoning. But before it’s packed up to be shipped out, there is one last important step in the process; a label in red, white and blue, marked “Made in the U-S-A” is affixed to the shipping box with pride by Lodge craftspeople. Aside from making world-class cookware, Lodge has another claim to fame; they host the annual Corn Bread Festival the last weekend of April, because as we all know, there’s nothing like corn bread, baked in a cast-iron skillet. Now where is my calendar? 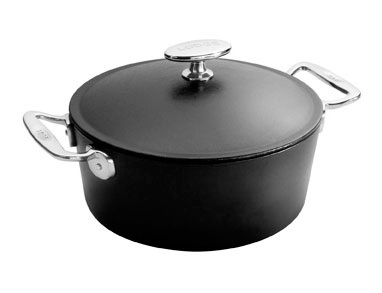 This entry was posted in american made, cooking, Kitchen, Made in America, made in usa and tagged Cast-iron cookware, Festus Haggen, Gunsmoke, Lodge Manufacturing, Ross Martin, Wild Wild West. Bookmark the permalink. 1 Response to Festus, be a darling and fetch me my cast iron skillet would you! Lodge cast iron is far cheaper than that. 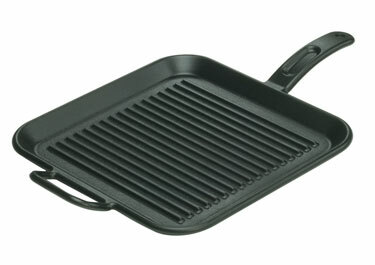 Even a 12 sllkiet is less than $20 on Amazon.Cast iron is slow to heat up and slow to cool down, which makes it great for staying hot when you plop that big cold steak in the pan. However, you may be disappointed in the uneven results if you don’t let your pan pre-heat on low/medium for several minutes. The middle will be searing hot and the edges will still be cold.